"Guide to Understand Your Total Cost of Ownership for Managing B2B Operations"
The first step in developing a strategy for optimizing your operations in B2B E-commerce is to determine the total cost of ownership (TCO) . The B2B environment is complex and a “true” TCO comparison must be considered to avoid mistakes and take right steps to lower TCO. So what cost, speed and agility factors must be considered to determine if your B2B E-commerce program should be developed in-house or outsourced? How can your business sort through the complexity in order to develop a strategy for creating a mature B2B E-commerce program that will yield benefits such as reduced costs, improved capabilities and increased customer satisfaction? What expenses must be carefully examined to provide the most accurate determination of TCO? 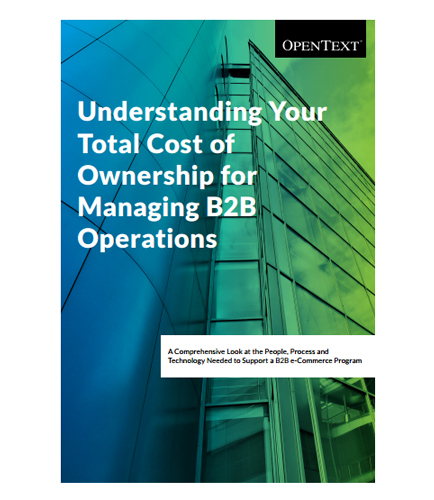 This TCO whitepaper encompasses more than just the hardware, software and infrastructure costs .It shows how to identify the key roles, tasks, and cost components that should be considered in a comprehensive cost analysis of managing a B2B E-commerce program.